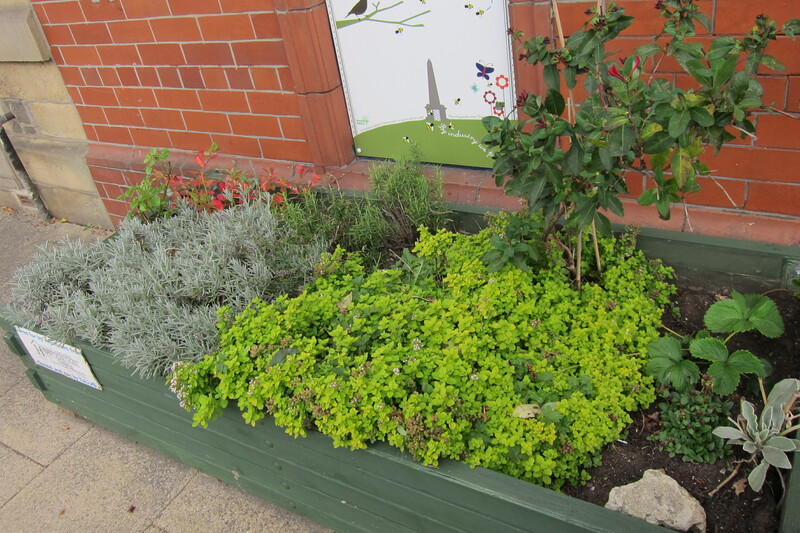 Community gardening is growing! This Saturday over 100 people attended the Be Incredible Conference in Todmorden, the home of the international Incredible Edible movement. 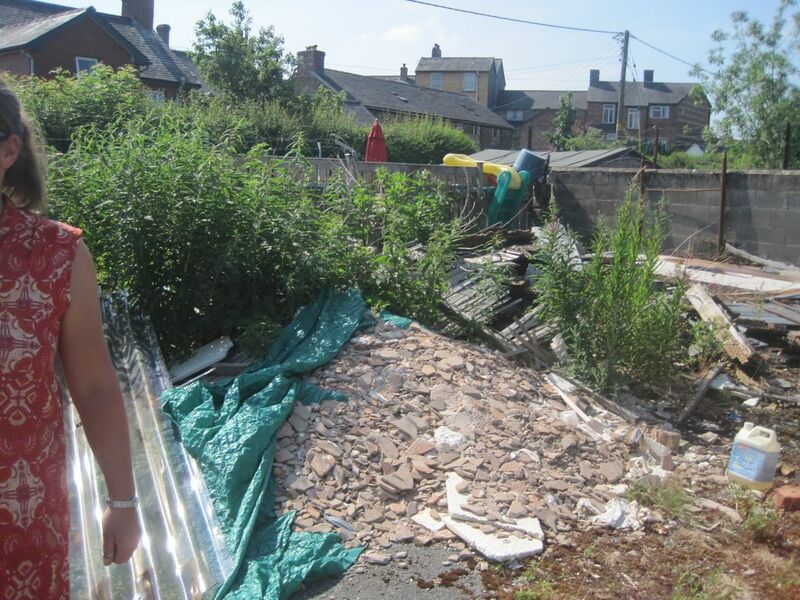 It was inspiring to see so many people ‘progergander’ gardening in their towns. 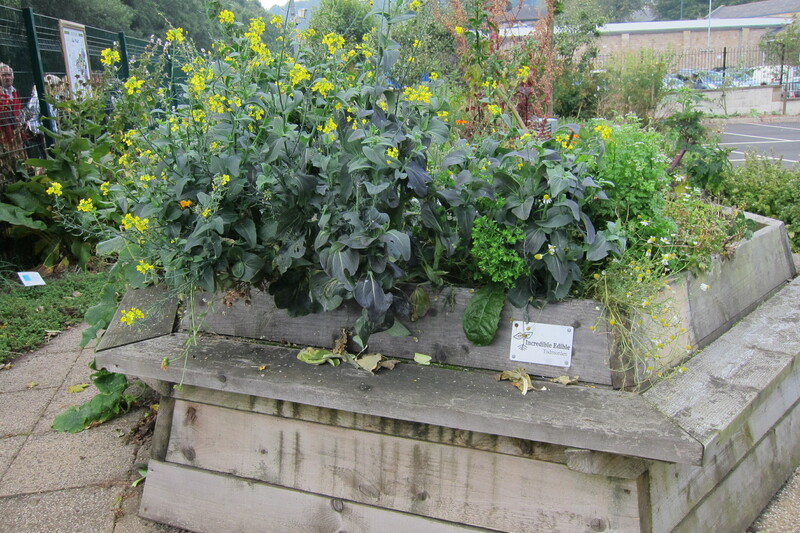 Todmorden started Incredible Edible in 2007 and now the town is absolutely full of edible plants, it’s fantastic to see. The idea behind the movement is to provide good local food for everyone through working together, supporting local businesses and learning about food. We are doing all of these things right here in Newtown, so it was great to meet up with other people doing the same thing across the country. In Todmorden, even the new Health Centre has been planted up with pears, apples, raspberries and herbs all up for grabs. The canal path is lined with mint, the station with herb beds. There is even a ‘vegetable tour’ to take in all the sights. The movement has captured the imagination of so many towns, that a national network has been developed to allow people to share ideas and get in touch with other projects. 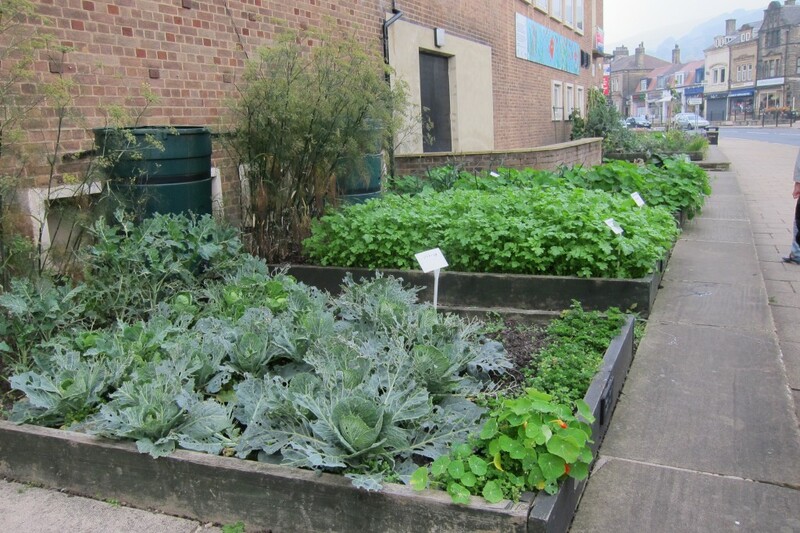 We have a fantastic community garden established next to the College…is it time to branch out and start ‘propergander’ gardening around the rest of Newtown? The way the World produces its food has changed completely over the last 50 years and the FOOD INC documentary film explores the changed world of food production in illuminating detail. This is a must watch for anyone interested in a food secure future. 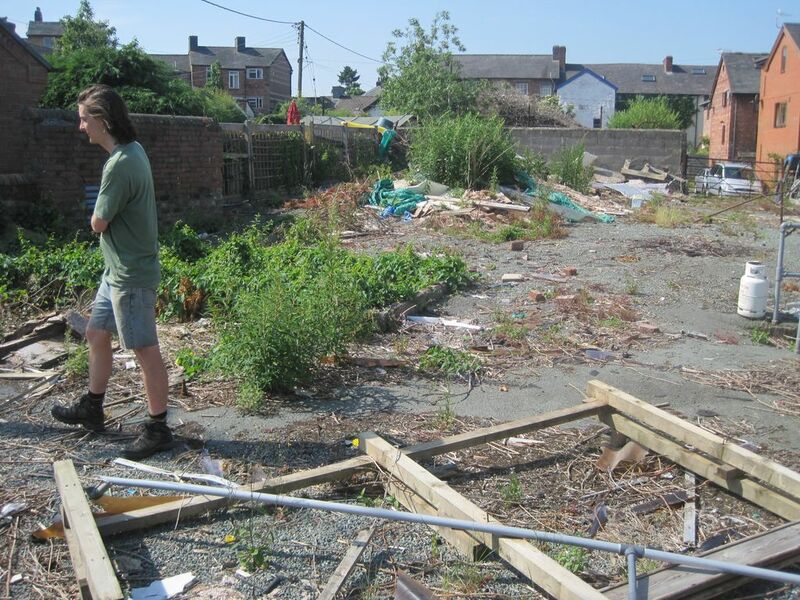 We ran this week long course last year to design the Pen Dinas community garden site we have here in Newtown. 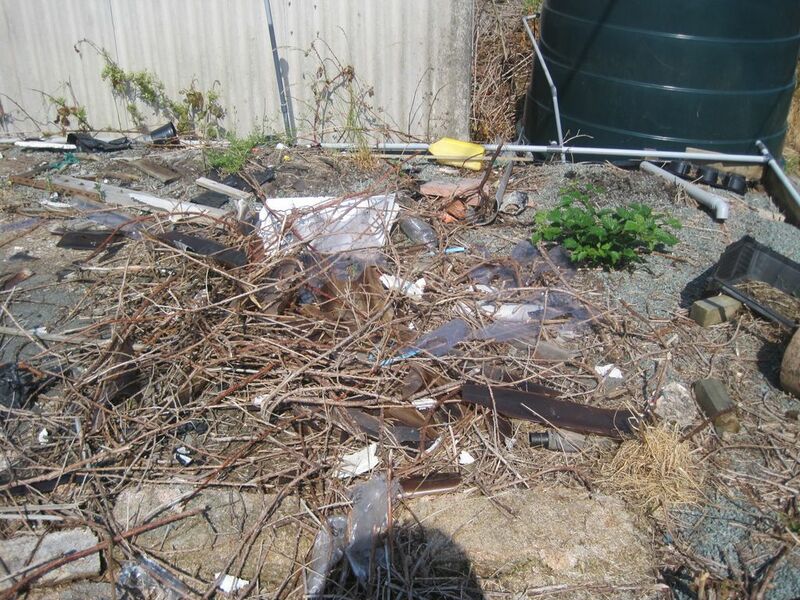 This year we are going to be working on a community garden site in Llanidloes as well as a school site Caersws. 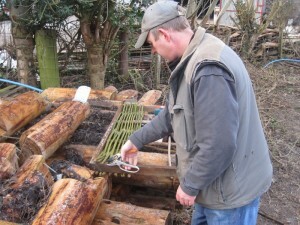 The 5 day course will be based in Newtown at the Get-Growing centre next to Coleg Powys. 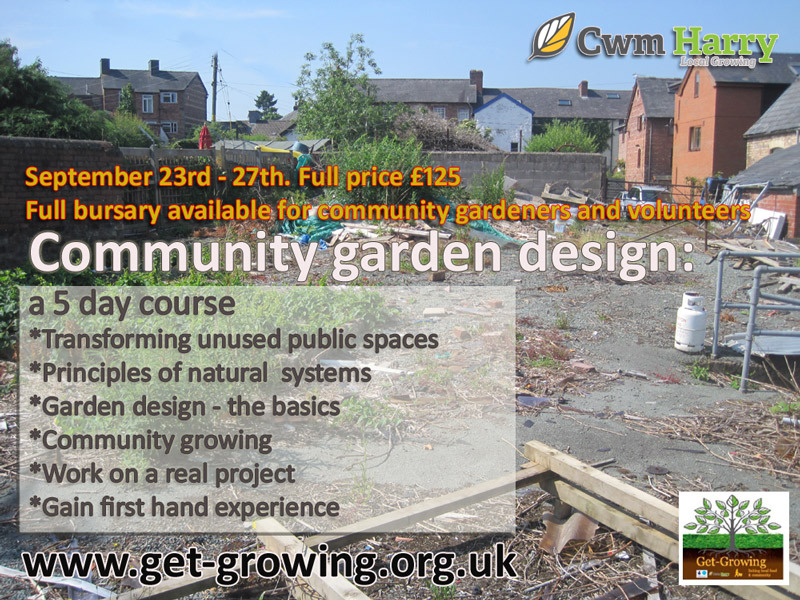 The course will be an excellent opportunity for anyone interested in community growing, garden design, permaculture and putting those interests into practice. Our towns and communities are full of odd unused spaces.. just going begging for someone with a bit of drive and imagination to see the potential it. 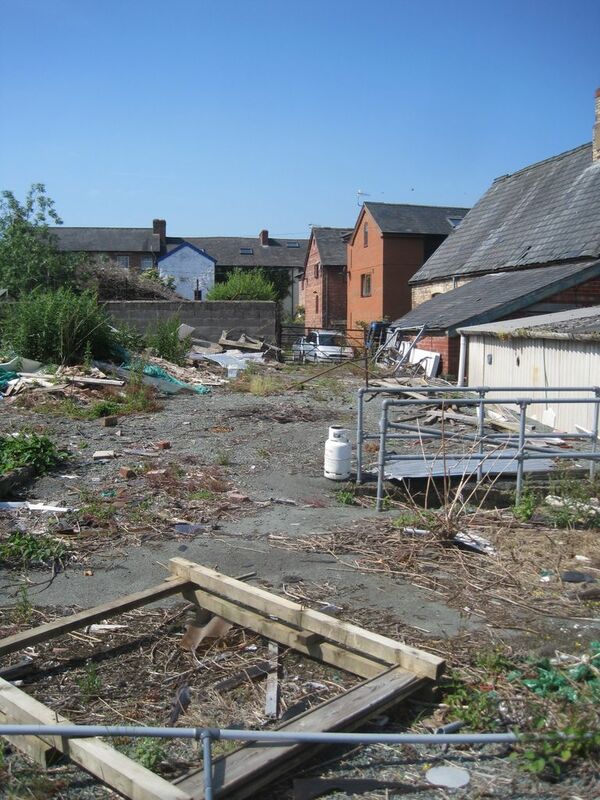 Dead urban blighted spaces can quickly become attractive and productive wild life heavens. 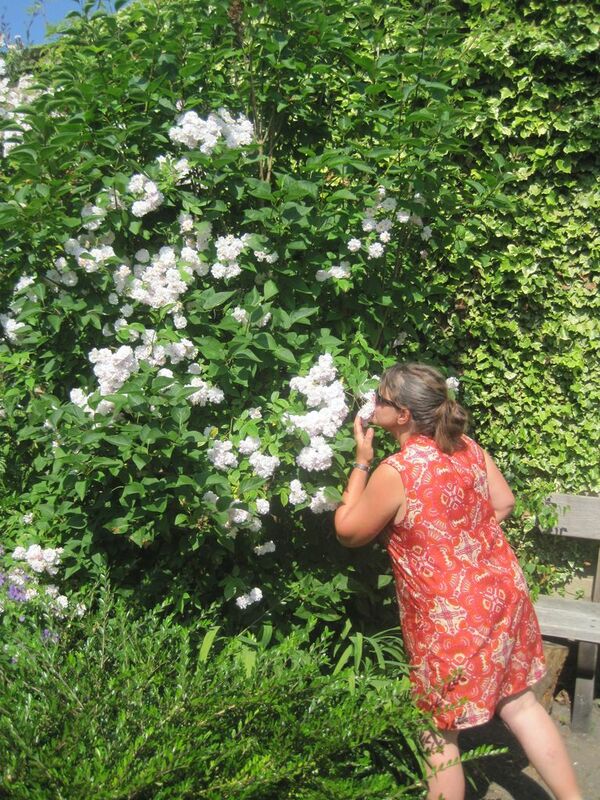 With tutors Emma Maxwell, Sue Stickland (tbc) and Steve Jones you will get an insight in garden design process, drawing and presenting ideas as well as a thorough intuition into the principles of natural systems and working with nature and wildlife. Participants will get to take part in designing a real site, undertaking client interviews and in generating an integrated site design. The resulting design will be implemented and there will be an opportunity for local residents to become fully involved in this process. The focus for the week is fun, practical and in generating a real tangible outcome. 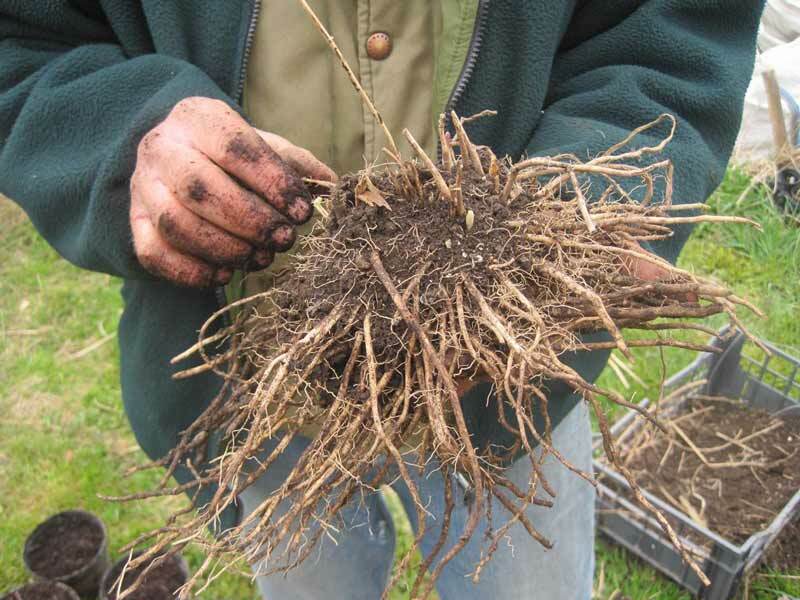 This will give you the tools and confidence to go out and design a community garden for yourself. 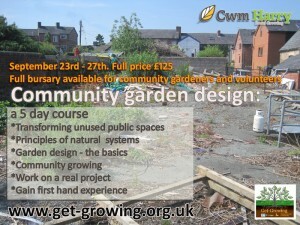 Full price of £125 includes lunches and the whole course.. but for those involved in community gardening, either actively or as a volunteer then there are places available on application for £25 only. 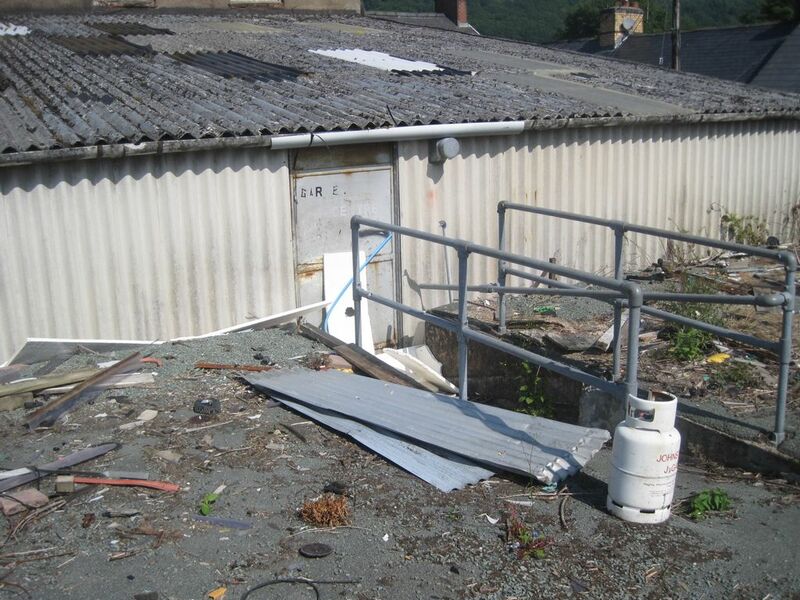 This challenging but excellent site has all the ingredients that we look for in a site and to a certain extent the dereliction and waste make it even more attractive in the light of the potential for transformation. Emma Maxwell and volunteer contemplate the site at Llanidloes that we have been offered as a potential community garden. 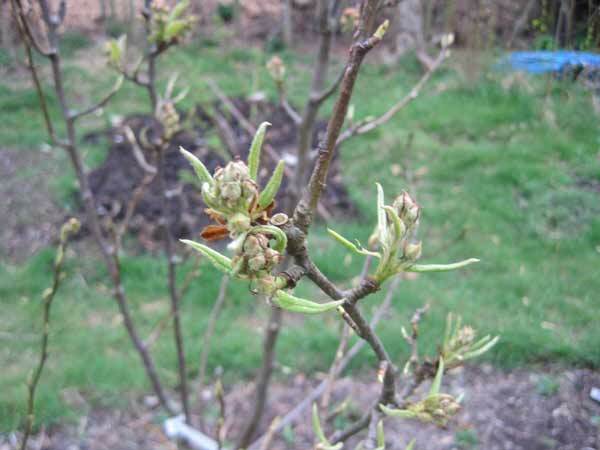 It is always a special and wonderful moment when the trees first break bud and the young leaves emerge.. signalling a new season. Especially when it happens rather late like it has this year.. having being plunged back into deep winter for three weeks with that late March snowfall. We have been busy all winter getting the garden established, so in some ways the late spring has given a couple of extra weeks of getting ready for the growing season to be fully upon us. 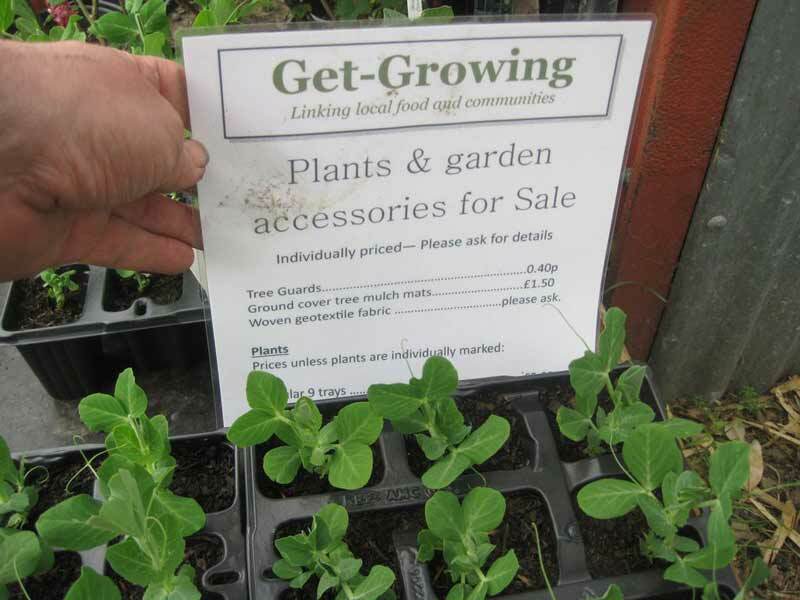 We have been busy propagating plants and we have a selection for sale from the Newtown garden. They are quality plants from organic seeds, mainly peas and broad beans at the moment as well as salad, with more coming. We are keen to develop a minimal tillage growing system and also want to minimise the use of fossil fuel powered machines but when it comes to establishing a new garden and breaking through long term pasture then there are not many options. We have had the ground covered for as long as we could manage to knock back the grass but it would probably have to be covered for the whole season to get it clear and we are of course impatient to press ahead and plant. 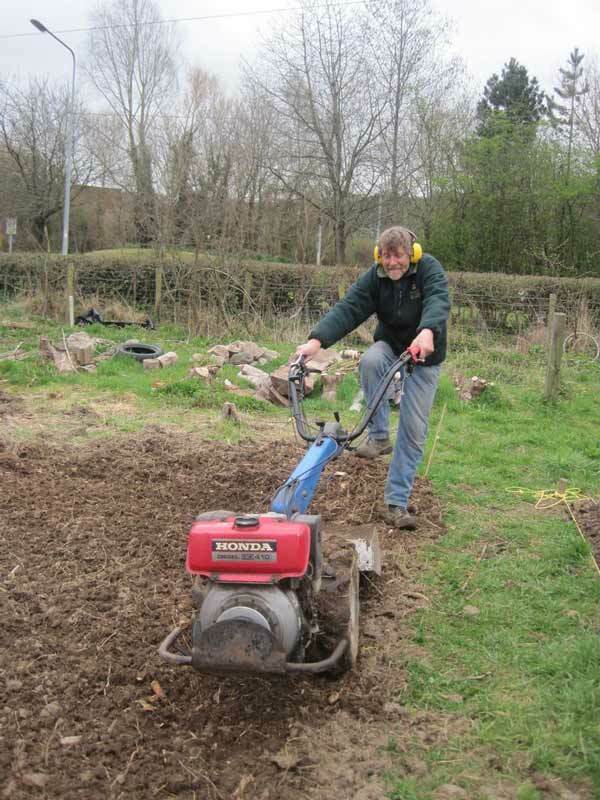 It has turned out be quite a challenge, the first machine we rented simply wasn’t up the job, the ground was too heavy, compacted and wet for the machine to et through it so we had to go up a size to a mini tractor sized rotovator. Finally we have gone over it all again, with the machine pictured and with the soil having dried out a bit as well is breaking up into a finer tilth.. much more useful for what we need. 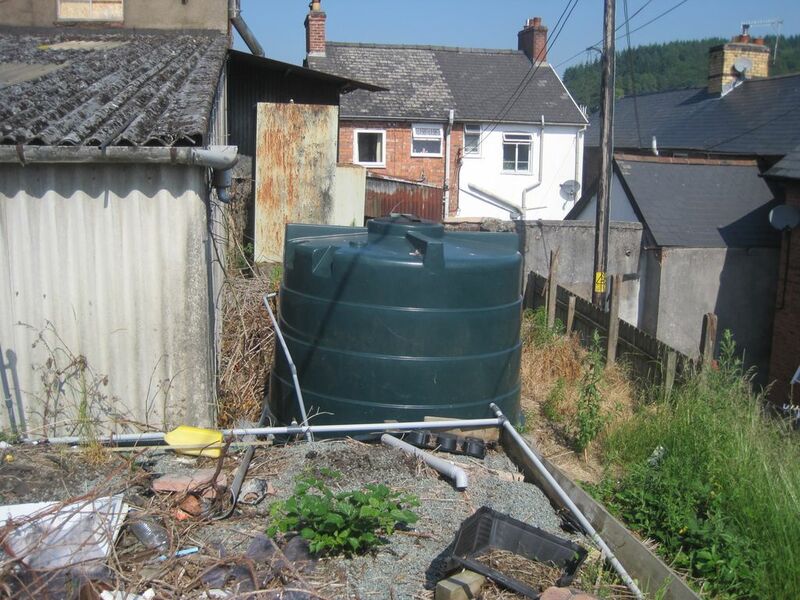 If we maintain this well, and keep it covered when not in use we should not have to plough it up again… hopefully this will give us the head start we need to get on top of and and develop our no dig system. Of course we have also built three Huglkultur beds.. inspired by the work of Sepp Holzer and these we have covered with permeable garden fabric, which will kill off the grasses whilst allowing moisture to penetrate. 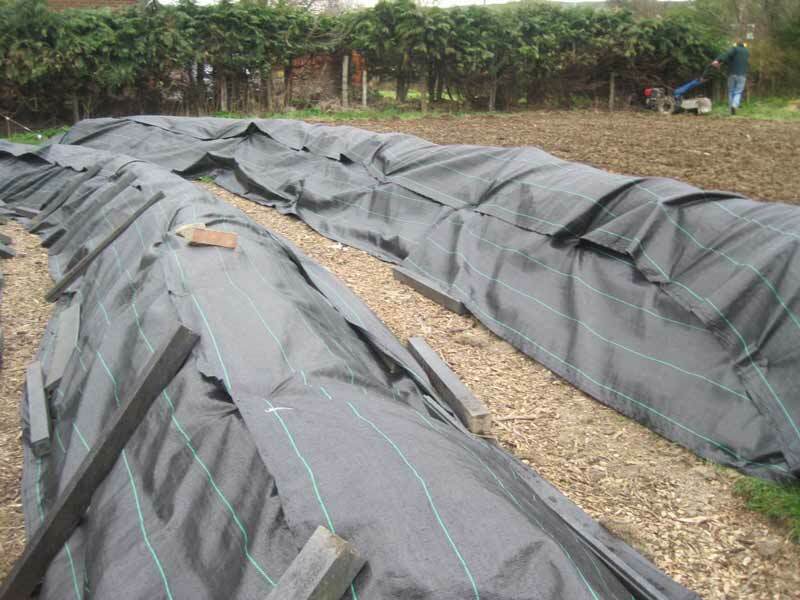 The plan for these beds is to plant through holes in the fabric with strong plants like pumpkin, courgette and squash.. which again will help establish a veg growing system and suppress grasses and weeds. 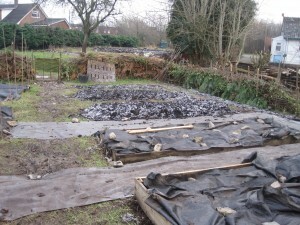 it is a big experiment for us, these beds but many others who have tried this method are reporting successes, so although it has been a lot of work to establish them it should be well worth it in the long run. Here s a very healthy looking asparagus plant.. this crown was grown from seed a year ago and is now ready for planting ou in a dedicated bed where it should produce regularly for 10 years or more. Again this is something that takes a lot of work to establish.. but should be well worth the work in the long run. 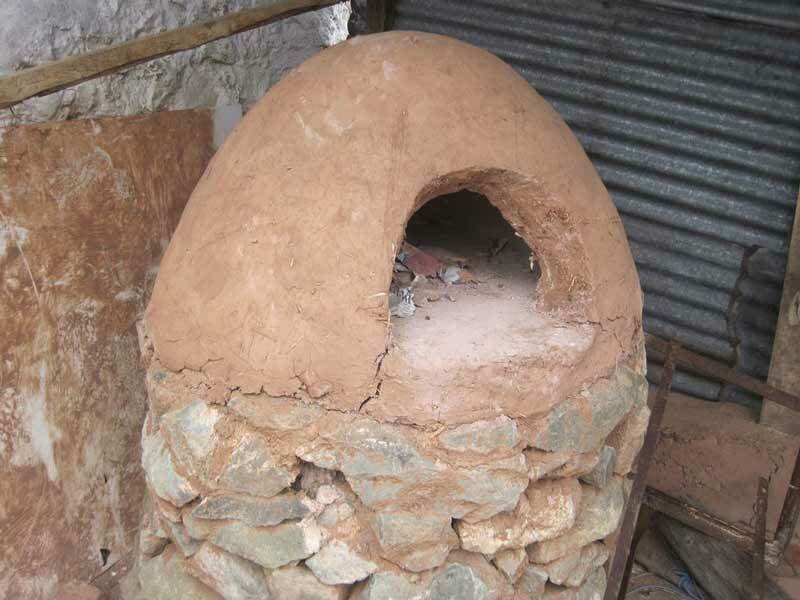 This picture is from another project where I was working at the weekend, it a fabulous clay oven which works by thermal mass and clever design to get a roaring fire inside to heat it all up. We are planning to build something similar to this at Pen Dinas.. and we are already dreaming of pizza parties and the like.. enjoying some of our produce. There will be a course and opportunities to join in when we make this… so keep a look out for announcements. 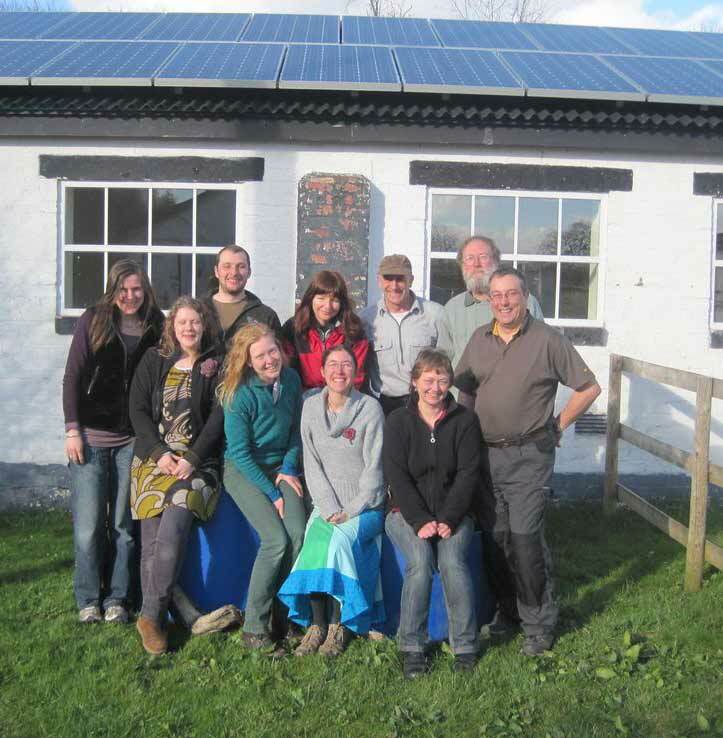 Graduates from our latest Permaculture Design Course, held over 6 weekends at Underhill farm, Llanymynech. 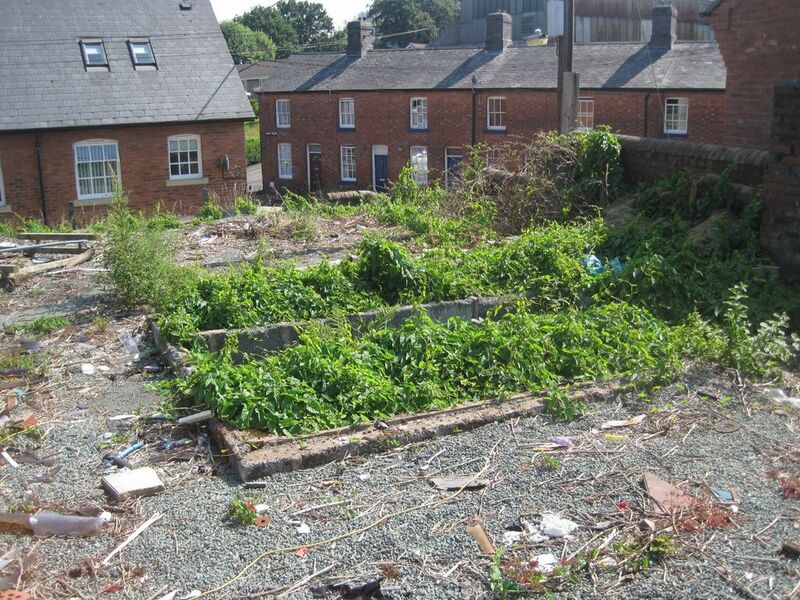 Permaculture Design is a system you can expect to hear more and more about in the future. It is a design system modelled from nature that enables the development of sustainable, resilient and nature friendly systems. It applies to gardens, homes, businesses, pretty much anything as it is the study of interrelationships and systems. 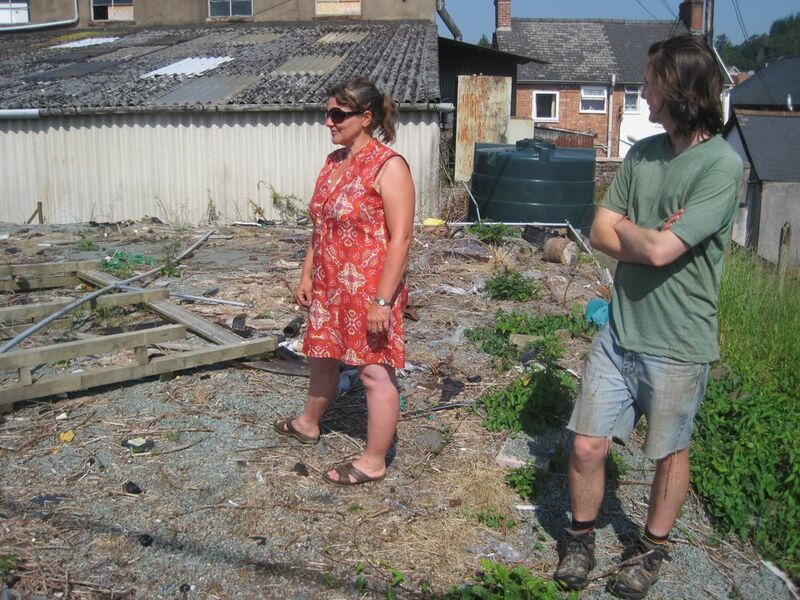 Those with an enthusiasm to study it are encouraged to take the 2 week Permaculture Design Course.. this covers an internationally recognised curriculum and visit sites working with those principles and brings yo into contact with other people with similar interests and convictions. Sector39 are a group of people who have delivered 20 of these specialist and inspirational courses and they are now coming to be part of the Cwm Harry organisation and are offering training, talks and introductions into this area. More details to come.. but anyone who would like to know more should visit the Sector39 website. It has been a busy week at Get-Growing as we have been flat out working to get the garden established before the spring is upon us and a new growing season starts. It has great to see so much progress in the micro allotment area, with nearly all the beds having been taken already and quite a few of them have already been dug over and prepared for the coming season. 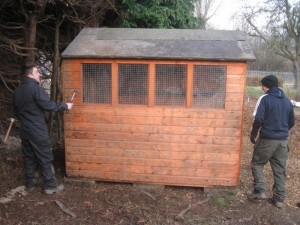 We still have a lot of work to do, rebuilding everything we had to take down in the old garden on the Vastre estate, so it was really good to see project apprentices Keiran and Matti get the tool shed back up and re assembled. Things tend to get damaged when left in a pile, so its a relief to see we still have all the pieces and that they still fit together. it has come to our attention that with all these people and the comings and goings the site gets really muddy really quickly, so building paths around the place is going to be a key task before the micro allotment people and everyone else starts getting busy. 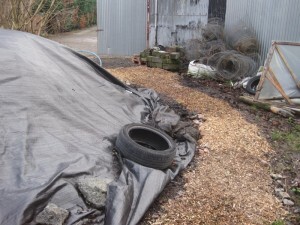 So the first attempt was this rubble and woodchip path into the composting area but we wil need to do lots more. 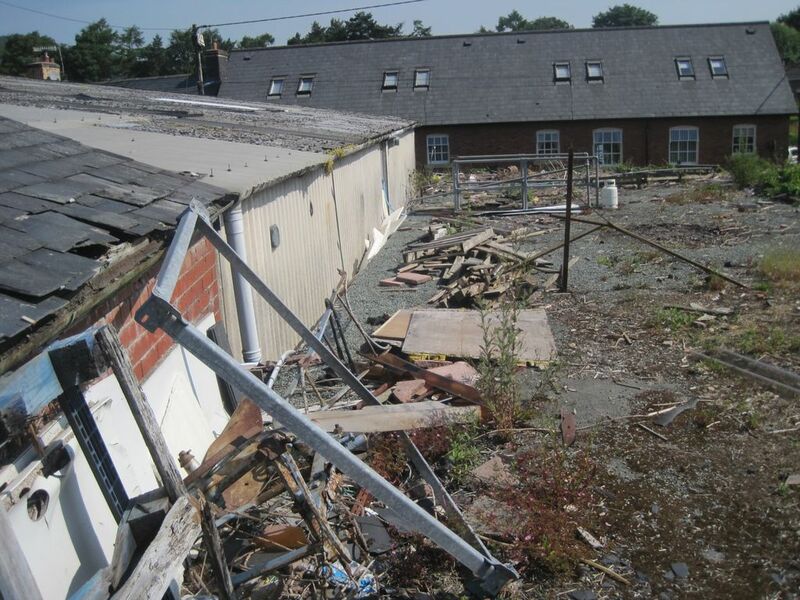 We are very well placed here at Pen Dinas, as G T Evans sawmill is just across the road. 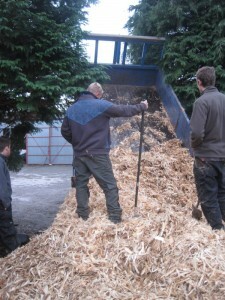 So I tried getting a tipper truck full of their bark shavings as a path material, as it is the cheapest material they have on offer and it should be easy to work with. It was quite exciting at the end of the day today when the truck arrived and we had to scramble to help un load. I think we have 6 cu metres of the stuff now to work with, so that should really help get the paths and access established and help give a lot more shape to the space here. 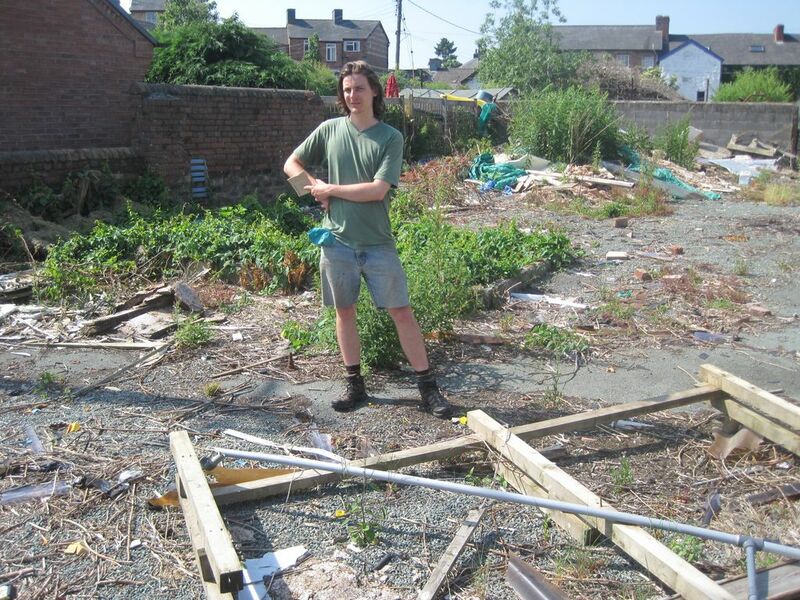 All good stuff, finally here is a pic of our longest serving volunteer Alex who has come up with a lovely design for a garden gate which will help define the Micro allotment area from the rest of the garden. I have now had a preliminary meeting with the Theatre Hafren team, who are keen to work with us on our conference idea… and we have a suggested date in mind to work towards now this is the 21st November a Thursday with the possibility of an evening session on the preceding weds.. lots more about the conference to come soon! Thanks to Dr Khesh Sidhu, public health specialist who invited us from Get-Growing to a cross departmental consultation meeting on the potential health benefits of community growing. Society is facing some key challenges, economic contraction, escalating food and energy prices, and massive public sector spending cuts. Added to that we have an explosion in depression and mental health issues, obesity, high blood pressure and diabetes caused by too much processed foods and sedentary lifestyles. It is not a happy picture and with declining resources to address these issues some fundamental questions need to be asked. I think the key points and ideas that flowed from the discussion is that there is an urgent need for a joined up approach to addressing this issues. The bigger picture for World energy is not bright and we can expect to see prices rise significantly, especially if the global economy picks up momentum again. 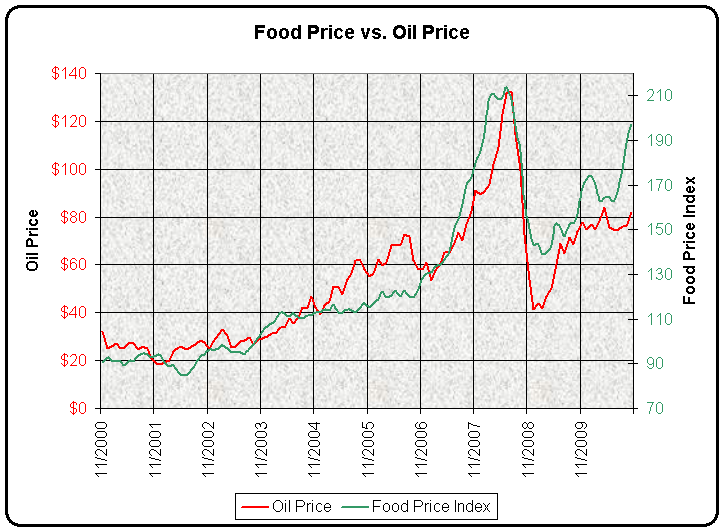 We also know that historically the price of food is closely tied to the price of energy and escalating costs of food will compound the problems significantly. Community growing has big future! It as apparent that a significant growth in the local food sector is required.. for reasons of sustainability and reducing stress on the planetary systems, food miles etc.. but more locally and significantly for communities here we need to enlarge this sector substantially and in a community participatory way as a means to address the health issues identified by the NHS public health sector. Getting communities growing will at least begin to make healthier eating options more available and affordable for individuals and increased levels of physical activity will also address some of the obesity and blood pressure issues and of course people working together doing something positive and meaningful, like growing food, composting, cooking and and distributing the produce will also address the isolation and underemployment for individuals which is often a significant driver for depression and other manifestations of mental illness. Novella Carpenter started small, with some plants in an empty lot next to her house in Oakland, California. A couple of years later, she was tending to a full-blown farm, with goats, turkeys, ducks, pigs, and a robust garden. This video tackles questions of neighborliness (which is more offensive: police sirens or roosters crowing? ), environmental poisons (raised beds are key). Really thoughful personal account of the urban farming experience and our changing realtionshp with food when we get invovled in producing it.